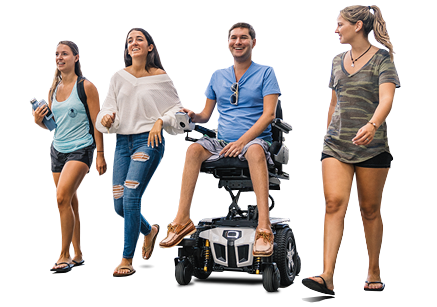 DURYEA, PA – Quantum Rehab® is pleased to announce the launch of the Edge 3, the most advanced power chair ever. The Edge 3 is the culmination of eight years of product improvement based on consumer, clinician, and provider input toward the award-winning Q6 Edge® series. It’s not a new power chair, but a better power chair, all based on market feedback. Building upon the Edge 2, the Edge 3 features the added benefits of SRS technology (Smooth Ride Suspension), 4.5 MPH iLevel option, standard fender lights, standard USB device charger, and standard drive-wheel accents corresponding with new shroud color choices. All enhancements were specifically market-driven. Specifically, SRS technology evolved from consumers wishing a softer ride – from reducing spasticity triggers to easing use with specialty controls to an overall smoother ride. The industry-first 4.5 MPH driving speed while elevated with optional iLevel meets the need for greater speed while elevated, such as when crossing busy streets. And, the standard fender lights, USB port, and new colors are lifestyle features that increase the overall user experience. In all, the Edge 3 offers a true user-sought power chair experience. For more information on the Edge 3, please click here for a video overview and visit QuantumRehab.com.